The list below are the tutorial titles and my summaries of each follow after that. I wish I could make demonstration animations for every aspect but I really don't want to prolong my training any more than it already is. The Enhanced Timeline tutorial is an overview of new enhancements made to the timeline, such as keyboard shortcuts, ways to manipulate the timeline window and more. It includes a look at four new selections that appear on the menu when you right click a key frame including; Hold (freezes a key frame over a set number of frames before continuing the animation), Label (change the color of a key frame to make it stand out), Select Key frames to right (selects all key frames right of the current frame), Interval (sets the speed/smoothness of the animation simulating animating on 2's or higher numbers). Key Frame Editing is an overview of the various ways you can add or edit key frames. Of particular interest here is the ability to select multiple key frames, then change something on one key frame and have that change reflected across all the key frames relative to the first frame that you edited. For example, if you've edited an object through a motion path and want to move the entire motion a short distance to the left, you can by selecting all the affected key frames and moving them left on one frame. Praise the Lord, Finally!!! The Actions tutorial shows you how to create character actions, save them and reuse them at any time. This video tutorial really should have come a lot sooner in my opinion as the ability to save and reuse motions is a big time saver. I won't go into detail but essentially this shows you how you can save any motion as an Action, re-use them, combine them and more on the timeline. Despite watching so many tutorials that have made mention of Moho's motion graphs I really don't understand their purpose. After watching the short tutorial on Editable Motion Graphs I have a better understanding that the graphs represent animation paths of your characters and objects but I don't understand why you'd edit the paths in the timeline rather than in the stage window? Ease of access I guess? With the Bounce, Stagger and Elastic tutorial we're finally starting to get back into the more visually cool stuff that Moho can do. The title is fairly self explanatory and shows how you can easily add each of these effects to your animation through changing a simple setting on the appropriate key frame in the timeline. Another tutorial that you'll want to remember as these are features you may use a lot. 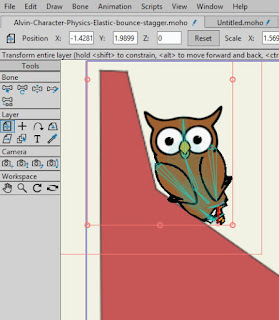 The Advanced Physics tutorial shows that it is actually, surprisingly easy to set up physics based animations in Moho by adjusting a few settings on the various objects that you want to be affected by physics properties. I was expecting this to be much more complicated but if you bookmark this tutorial you'll get back up to speed in no time when you decide you need this feature. That's it for this installment. I have twelve more pro tutorials to go before, finally, getting to the tutorials showcasing all of Moho's new features for version twelve. I will be glad when I'm done. At this point I am convinced Moho is more than capable for 2D animation with advanced tools that you just won't find in comparably priced software. My only concern is that I don't find it fun to use because so much time is spent on the timeline and adjusting settings... feels more like programming than animating. Continue to the next post.